Add canned tomatoes to a food processor or blender and pulse until smooth, but still slightly chunky. Wash and dice finely celery, peppers, onions, and cucumbers. For cucumber, peel the cucumber and scrape the seeds out with a spoon before dicing. Add veggies to the processed tomatoes. Mince garlic and chives and add to the mix. Add olive oil, red wine vinegar, and sugar to mix. Wash heirloom tomatoes well and cut out the stem part. Then dice. Add the tomatoes and any juice to the gazpacho. Taste the gazpacho and season well with salt and pepper. Adjust flavors for vinegar and oil as well. You can serve this immediately, but it's best if it chills in the fridge for an hour before serving. It’s really tough to find something in the food world that’s better than a ripe August tomato, in my opinion. As a kid, my dad used to grow tons of tomatoes (not literally). I would spend afternoons just going through the vines, picking the ripest ones and eating them on the spot. These days, heirloom tomatoes are all the rage – and with good reason. They have a great texture and flavor that’s much deeper than your standard beefsteak tomato. In my opinion, they are worth the few extra bucks. And remember the golden rule about heirloom tomatoes. Typically, the ugliest ones are the tastiest! This heirloom tomato gazpacho uses a few fresh tomatoes along with tons of fresh veggies to make a light, cold soup that’s perfect for the hot days of summer. Of course, the most important part of any good gazpacho is the tomatoes. In my gazpacho, I like to use some canned tomatoes for the soupy base and fresh tomatoes as a major add-in. Just one can of tomatoes is more than enough. One of my favorite canned tomatoes these days is the organic Muir Glen. They have a really fresh flavor and work great in dishes like this. To prep them for the gazpacho, just add them to a food processor or blender and pulse them a few times. You don’t want to blend them completely, but you want to break them down a bit. Some chunks are good. Now it’s time to get chopping! This recipe only takes a few minutes to make if you’re a solid chopper. If you’re not a good chopper, then this recipe will make you one! Spend time on the celery, onion, pepper, and cucumber to make sure you get nice even pieces. Once they are all chopped, you can add them in with your processed tomatoes. 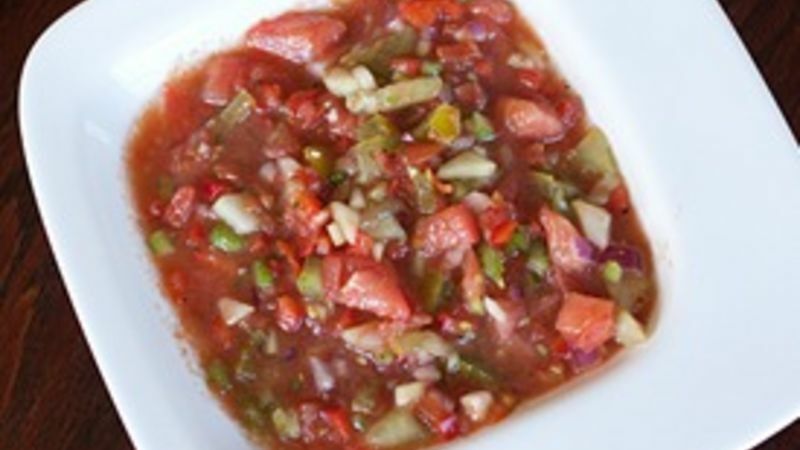 There are a few other flavors that I like to add to gazpacho. These are stronger flavors, so go light on them. Especially be careful not to over-do the garlic. More than a clove would be too much. Mince those and add them to the gazpacho mix along with the olive oil, red wine vinegar, sugar, and lime juice. In my opinion, the vinegar is maybe the most important ingredient besides the tomatoes. It isn’t optional. Now it’s time to tackle those heirlooms. Even though one of my tomatoes is green, it’s actually ripe. That’s just the color of it when ripe. Heirloom tomatoes come in all colors, shapes, and sizes, which makes them really fun. Dice up the tomatoes and add them to the mix! Be sure to scrape in any tomato juice as well. Then just stir everything together with a spoon and taste it! You’ll probably need to add a good pinch of salt and pepper. Also, feel free to add more vinegar or olive oil to suit your tastes. Make it yours! You can definitely serve this right away, but it’s even better if you let it chill for an hour or two before serving. Not only is this recipe really healthy, but you also don’t have to cook anything, which is a huge win in my book on a hot summer day. If you’re trying to beat the heat, give this a shot! Nick averages at least a tomato a day for the month of August. Check out his blog, Macheesmo, and his Tablespoon Profile!